Our first few days in Italy this May were a mix of sun and rain. After a spring of nonstop rain, we felt lucky to have even a little sunshine! Spello, it turns out, was on one of those cloudy days. Still, it did not dampen our enthusiasm for what turned out to be a very nice city. 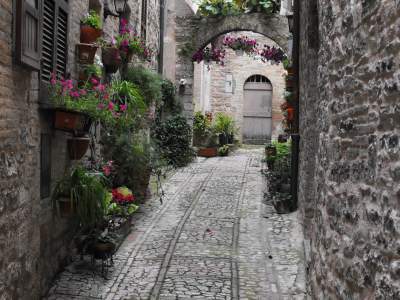 Spello sits in the shadow of Assisi and so may be a bit overlooked, which is a tad sad, It is a delightful place. We were lucky enough to be there as they were in the midst of a spring celebration called Windows, Balconies and Flowers. As you can see in the pictures it is a glorious time of flowers spilling out of everywhere. Later in the summer is an annual celebration called Infiorate. 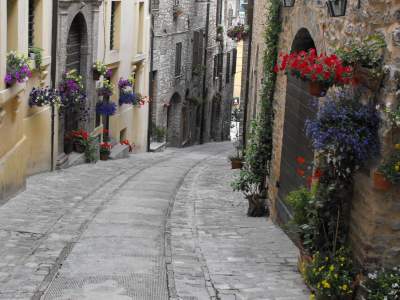 Neighborhoods decorate streets with intricate patterns made with flower petals. We could only see pictures from previous years. But, as it turns out, I came across a couple of entries about the festival in the Italian notebook. Here is a second entry. Just below the town and outside its walls is a Roman ruin with mosaic floors that is quite impressive. 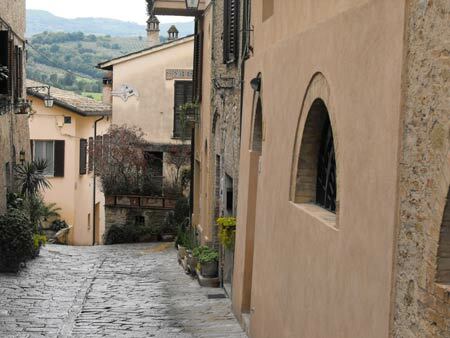 Spello is a town worth visiting. 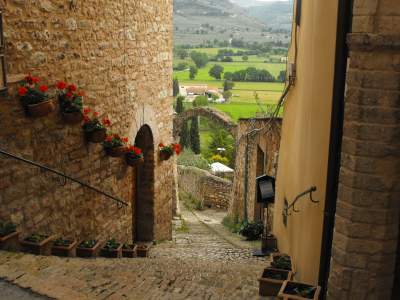 In fact, if you want to avoid the tourist-heavy Assisi but be within shouting distance, Spello would fit the bill. 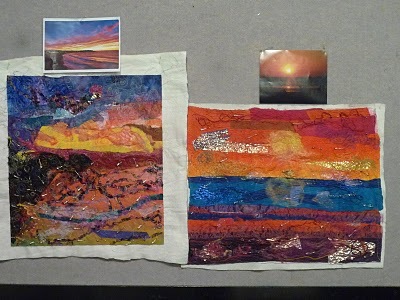 Lisa Walton, from Australia, will be teaching “Textured Treasures” in Orvieto September 26 – October 2. It is really beautiful work Lisa does. She just finished teaching the same workshop in Australia and you can have a look at the work on her blog. This was the first entry and there will be more. Join us with Lisa – we still have several spaces! 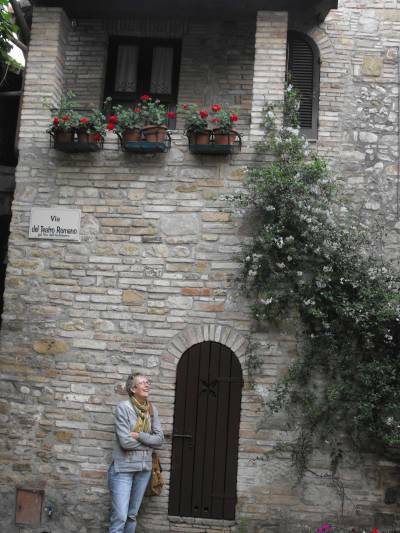 Before our groups arrived in May, Kristi and I took a few days to explore parts of Umbria we had not seen before. There are times we travel to Italy and get around completely by bus and train. But we do like to rent a car which allows us to see places less easily reached by public transport. It also enables us to see and wander the countryside, which is so beautiful, and to make discoveries you won’t from a bus or train. 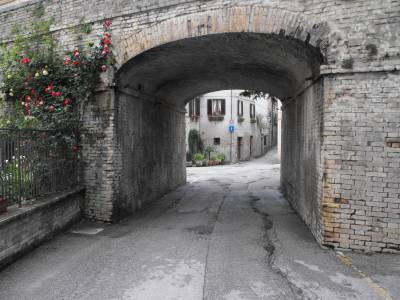 We based ourselves in Bevagna. This is a truly nice medieval town set in a flat valley that derived its protection from walls and a river on one side of the city. 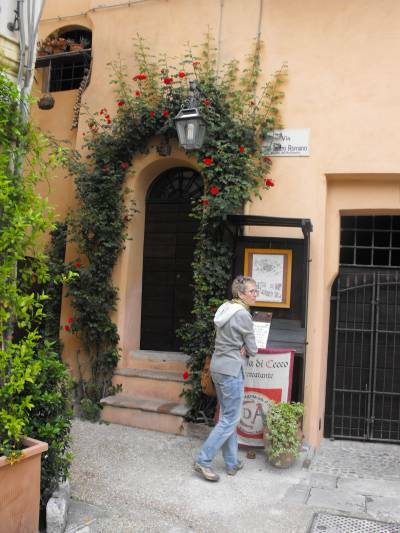 We stayed at the Hotel Palazzo Brunamonti, a very pleasant, affordable hotel on Bevagna’s main street. The staff was extremely friendly, helpful in pointing us to some excellent restaurants. We spent three nights in the city, eating at a very different and delicious restaurant each night. 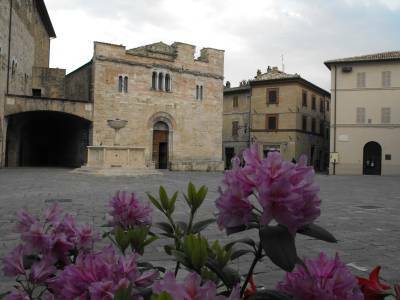 The main piazza is a pleasant space with two churches, one of which is seen here, town hall and a communal building. This is where the passeggiata begins and ends, although it is a modest affair here. 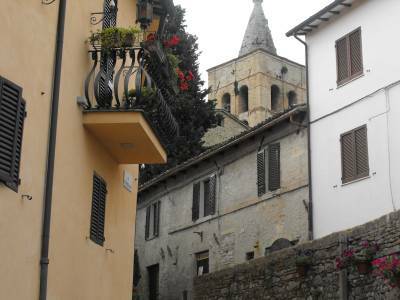 This is the second church’s tower in the main piazza seen from another street. 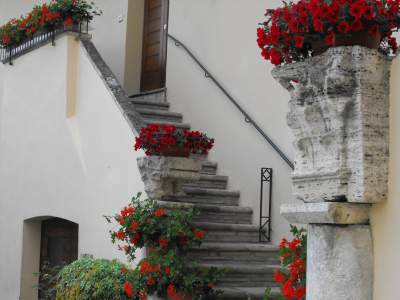 The town is really quite charming with lots of flowers. 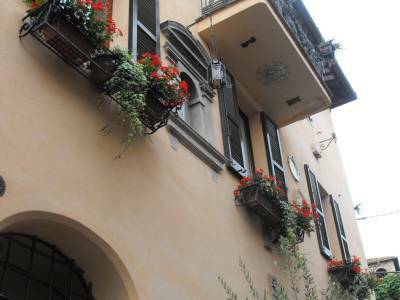 We watched, while sitting in a piazza, one women on the second floor fill her flower box with beautiful, newly purchased flowers. The town is extremely well maintained and clean. Buildings looked like they had been recently cleaned, and people took obvious pride in their place. 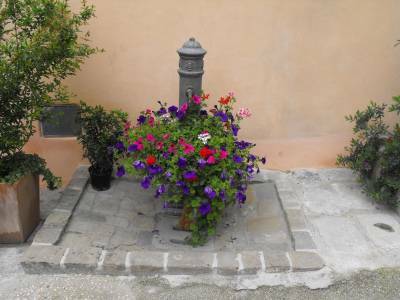 We love the way Italians train all manner of plants over doorways coming out of pots or a small hole in the pavement. 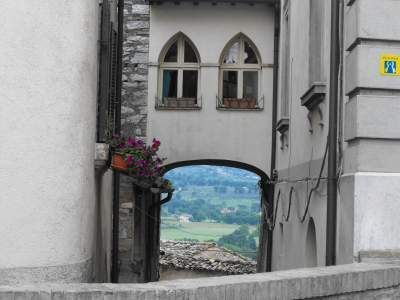 This archway goes under a bridge that crosses the river to the left, which at one time gave the town some protection. Near this spot is the remains of a Roman coliseum. It has now been turned into an exquisite restaurant called Redibi. When you are seated the tables are actually in the space that was under the seats of the coliseum, gently curving. Fabulous service, different and very good food. The second great meal we had was at Ristorante Enoteca Piazza Onofri. It was on our first night in Italy and it was such a treat to be eating great Italian food and drinking a very nice wine! 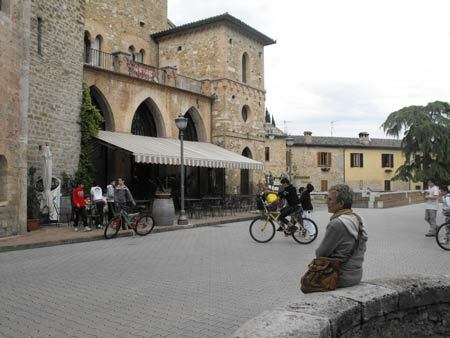 One of the things we liked about Bevagna was this piazza and the kids who hung out there. Some days they had bikes, others they were on foot. They would talk and play, get refreshments from the bar under the awning.